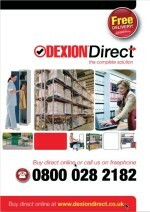 If you would like any further information about Dexion Direct, please complete the form below. Alternatively you can call us on 0800 028 2182. By completing this form and clicking submit form you consent to Dexion Direct holding your personal details for the purposes described on this page. We abide by the principles of the Data Protection Act 1998 and will ensure that the data is used for no other purposes and disclosed to no third party.